Knightsbridge, one of the UK’s leading contract furniture manufacturers, has published its new guide to its complete healthcare furniture collection. The guide embraces a variety of patient seating, recliners, waiting area seating and patient furniture which has been designed specifically for use in hospital and ward environments, benefiting from infection control, manual handling and pressure relief features. Newcomers to the collection include Memphis, a new patient seating range with an aesthetically pleasing design suited to ward areas, consulting rooms and specialist departments. The inFINITE beam seating range provides a dynamic fully customisable seating solution, and Quest a series of overbed tables with easy clean properties suitable for wards, waiting bays and clinical rooms. Knightsbridge’s complete healthcare furniture portfolio features a selection of specialist furniture including extra care, dementia and bariatric users. 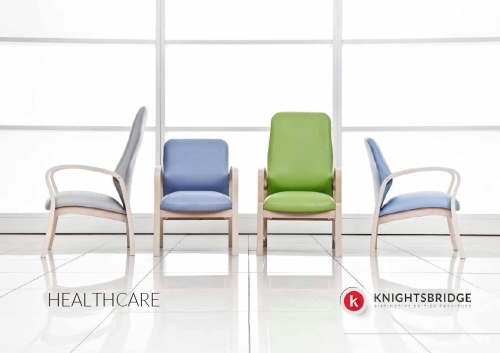 For more information on the complete Knightsbridge Healthcare collection or to request a brochure visit www.knightsbridge-furniture.co.uk, call the sales team on 01274 731900 or email enquiries@knightsbridge-furniture.co.uk.